Start your day right with Carrot Cake Oatmeal. 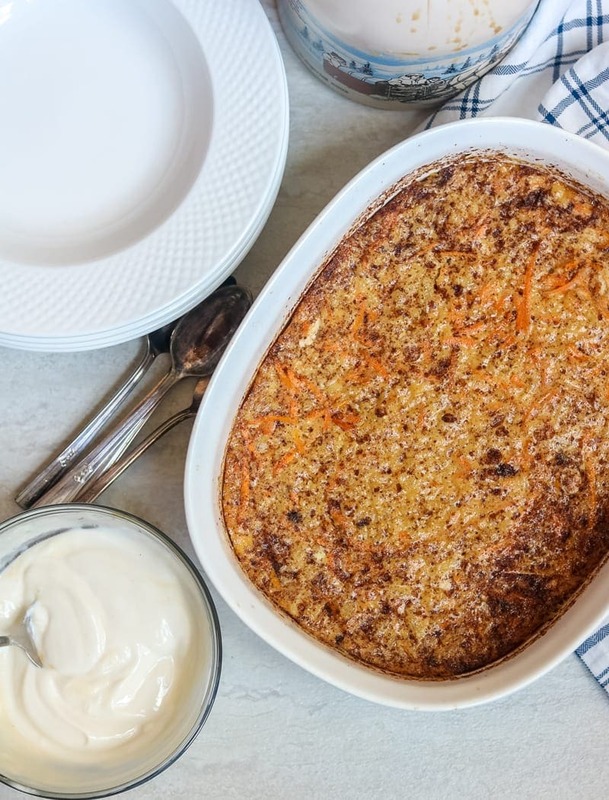 Steel cuts oats mixed with shredded carrots, walnuts, crushed pineapple, and coconut milk is baked together to perfectly mimic the flavors of a carrot cake, complete with a tangy sweetened “icing.” This delicious Carrot Cake Baked Oatmeal is loved by everyone! Looking for more Carrot Cake Recipes? Check out my Instant Pot Carrot Cake Cheesecake and Healthy Carrot Cake Muffins. My mom adores this Carrot Cake Oatmeal. But she also HATES oatmeal. My mom does not like oatmeal because she does not prefer a soggy texture to her morning breakfast. She is the type of person who needs to pour her milk onto her cereal just moments before she eats it, or you might as well throw it away. However, she has discovered after eating my Strawberries and Cream Overnight Oatmeal, she does like Steel Cut Oats. She loves their chewy and hearty texture. And my mom loves all things Carrot Cake, like my Whole Wheat Carrot Cake Muffins and Instant Pot Carrot Cake Cheesecake. So, being the perfect daughter that I am, I have created for her a healthy breakfast recipe that combines her favorite cake and her beloved steel cut oats into a dish that will power her through her day and satisfy her longing for a slice of decadent carrot cake. Grease an oval 2 quart baking dish or 9×13 pan with melted coconut oil. Mix together oats, juice, eggs, 1 teaspoon vanilla, pineapple, walnuts, maple syrup, coconut oil, carrots, and cinnamon together. Pour in prepared baking dish. Bake oatmeal until oats have absorbed liquid and are tender. Mix together the yogurt and maple syrup. This is an optional icing, but is a super fun way to dress up this oatmeal. Frost the warm oatmeal with the icing. You can also make this baked oatmeal in the slow cooker. Place all ingredients into a greased slow cooker and cook on low for 6 hours. Feel free to use omit the eggs from this carrot cake oatmeal if you have egg allergies–it will still taste just as delicious! The baked oatmeal will just not set up like a cake would. I recommend canned coconut milk for these baked steel cut oats, as the flavor is perfect for the baked oatmeal. You can use all canned coconut milk (instead of an additional 1/2 cup milk or water). If you don’t want to use Greek yogurt to make a topping for the baked carrot cake oatmeal, you can use coconut milk yogurt to keep this oatmeal dairy free OR omit the yogurt topping all together. I like to add the yogurt for an extra dose of protein and additional creaminess in this baked oatmeal recipe. Omit the nuts in this oatmeal for any nut allergies. You can also just top your oatmeal with nuts when serving if you have one person in your family who likes oats and one who does not. If your pineapple does not yield a full cup of pineapple juice, just add in additional water or coconut milk to make up the difference. If you have left over pineapple and coconut milk, a Healthy Pina Colada needs to be in your future. Start your day right with Carrot Cake Oatmeal. Steel cuts oats mixed with shredded carrots, walnuts, crushed pineapple, and coconut milk is baked together to perfectly mimic the flavors of a carrot cake, complete with a tangy sweetened "icing." 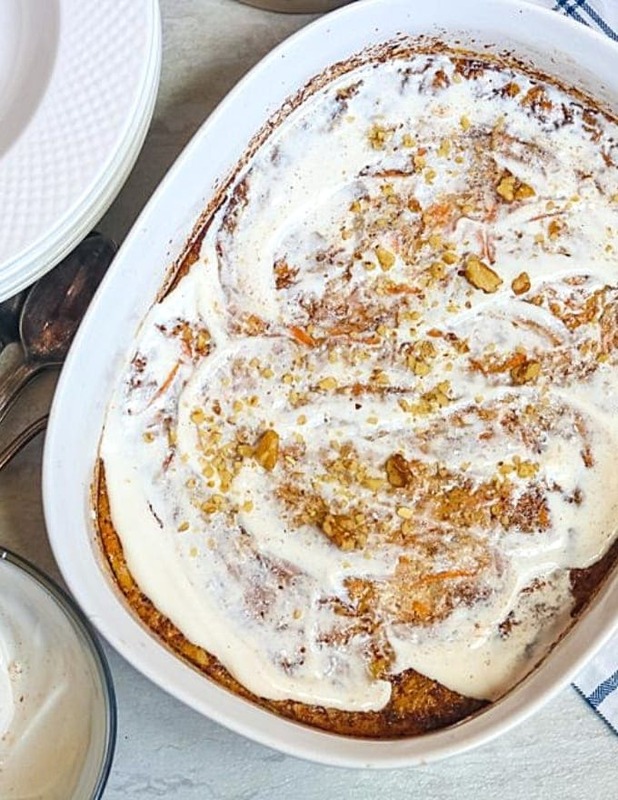 This delicious Carrot Cake Baked Oatmeal is loved by everyone! Preheat oven to 350 degrees. Grease a 2 quart of 9x13 baking dish. Mix together oats, milk, juice, eggs, 1 teaspoon vanilla, pineapple, walnuts, maple syrup, coconut oil, carrots, and cinnamon together. Pour into a greased pan and bake for 50 minutes, or until set. Mix together Greek yogurt, maple syrup and remaining 1 teaspoon vanilla. Serve oatmeal warm with a dollop of Greek yogurt and additional maple syrup if desired. Oatmeal is one of my favorite breakfast dishes, year round. I’ve never tried it with this combination of ingredients. I usually add raisins, cinnamon and whatever nuts we have on hand. I’ll have to give this recipe a try. Shirley–this is just a fun variation on oatmeal. We eat it everyday around here, so it is nice to have variety! Breakfast that tastes like my favorite cake? I am so there for these fun oats!!! Thanks Jocelyn. I hope you love it! This looks delicious and my hubs would love this as carrot cake is his favorite dessert! Anything that can get your husband to eat oatmeal in the morning, is a winner in my book! What a fun breakfast. You will feel like you are eating cake but actually having a healthy breakfast. Oh yum! We love steel cut oats around here. This would make a perfect easy brunch. I’ll pin it for the weekend! Thanks for sharing. This would be great for your weekend brunch! So simple and comforting, yet baked oatmeal is still on my recipe bucket list, not on my already making list! I adore carrot cake, so this recipe may be the inspiration I need. I hope it is in fact all the inspiration you need to make this Alisa! You ARE the perfect daughter. 🙂 I was originally resistant to this idea. I mean how can oatmeal possibly pawn itself off as carrot cake? But by golly, after reading the recipe, I think you nailed it. Steel cut oats are fantastic and there’ just enough egg here to hold everything together. Now I really must try this out of sheer curiosity. Plus, your photos look amazing. What a wonderful birthday gift. Thanks Susan! I will let my mom know you think I am the PERFECT daughter as well! Well, this is the breakfast for you Heather! Thanks! I hope you try this out and love it! I don’t think I’ve seen more perfect looking oatmeal in my life. I always choke it down because “it’s healthy” and I want to start my morning on a feel-good note, but MAN this would make my mornings a million times better! Who doesn’t love carrot cake?!?! Erica, I am so happy to give you an option that you will enjoy!! I can’t wait to hear if you like this! I am so so glad Kristen that you came to the party! 🙂 Love this recipe and it’s been requested again in my house! I really appreciate you sharing your latest creation at Making Memories Mondays! YEA!!! That is what I love to hear Cathy. You just made my day! Liz, it was so wonderful meeting you in person. You are such a kind and generous person! And I hope you love this oatmeal just as much as my mom does!! There are two different icing instructions listed: The first says to mix the greek yogurt w/the maple syrup. The proper recipe says to mix the yogurt w/the remaining vanilla and serve with maple syrup. Which is more delicious? Thanks! Hi Jeff, sorry for the confusion–I will update this now. I personally prefer to mix the maple syrup in the yogurt for the best taste. Enjoy! Thanks for the timely reply — it’s still in the oven!